Ciron Pharmaceuticals Inc. - Pharmaceutical Research and Development, Pharmaceutical Contract Research India, Pharmaceutical Research in India, Contract Research India, Contract Research and Development India, Pharma Research India, Pharma Research and Development in India, Research and Development in India, Pharma Contract Research and Development in India, Pharmaceutical Formulations India, Pharmaceutical Contract Manufacturing India, Pharmaceutical Toll Manufacturing USA, Pharmaceutical Toll Manufacture .. Designed by www.ambestmedia.com is specified as the websites creator. 19 other websites are located on this web server. Most of them are provided in the english language. 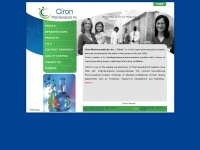 The websites of Cironpharma.in are hosted by a Microsoft-IIS server and were developed in the programming language ASP.NET. The markup language of the website is HTML 4.01 Transitional. The visitor analysis software Google Analytics is used to analyze the visitors of the websites. Both the inclusion of the website in search engines and follwoing of its hyperlinks is explicitly allowed.